Language. The art of verbal communication. It’s what binds and defines us – as individuals, nations and cultures. At Zebra Translations we provide clear and accurate communication in any language. 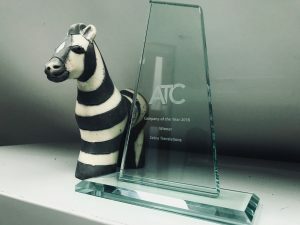 We are very proud to announce that Zebra Translations has won ATC’s “Translation Company of the Year” Award. The results were announced at the ATC’s Conference in Cardiff, Wales, on 20 September 2018. Zebra is delighted to have been chosen for this prestigious Award and it’s the perfect opportunity to thank all of our clients and suppliers for their support. It’s a great achievement for the entire Team at Zebra and we will continue giving our clients the very best service and the highest quality translations, as always. You can read more about our achievement here. We are a long established, highly qualified and experienced translation agency specialising exclusively in medical and pharmaceutical documentation. Lisa and I worked together for another translation agency but when, without warning in 1999, that company went into liquidation, we made the challenging decision not to waste our combined experience and expertise but to turn a negative into a positive. Zebra was set up one month later and seventeen years on we are still going from strength to strength. There was a big gap in the market for medical and pharmaceutical translations. The industry was just becoming regulated and we threw our hearts and souls into creating the UK’s first specialised medical and pharmaceutical translation agency. In 1999, there were only 8 EU languages required, now it’s 25 so we’ve kept up with our clients’ needs especially when it comes to the demanding deadlines. Our team of in-country, mother tongue translators are totally conversant with regulatory, pharmacovigilance and clinical documentation. More importantly, our in-house team of translators check, revise and edit all translations. Our clients have very busy and stressful projects and our aim is to make the translation process as easy as we can for them. Clients do not have time to waste and missing a deadline would be expensive and time-consuming so we never make promises we can’t keep. It is vital for clients to know that their suppliers can demonstrate compliance so we achieved ISO 9001 accreditation in July 2005. We really are here to help you; we aim not just to meet your expectations but to exceed them! Zebra is a member of the Association of Translation Companies (ATC) and Federation of Small Businesses (FSB). Its senior in-house linguists are individual members of the Institute of Translation & Interpreting (ITI) and/or the Chartered Institute of Linguists (CIOL).